Melissa & Doug 2424 - Stamps feature contoured wooden handles and high-quality rubber. Fairies, flowers and garden critters can be combined in countless pretty ways! This extra-large stamp set for kids makes it easy to create an exciting storyline or a color-in scene: It includes 20 rubber-faced, wooden-handled outline stamps and a two-color stamp pad filled with pink and purple washable ink. Includes 20 stamps, durable 2-color stamp pad, 5 colored pencils, and wooden storage tray. Charming fairy-garden theme. It's a complete arts & crafts activity and storytelling kit in one! Themed stamp set with everything needed to create and color detailed picture scenes. Encourages hand-eye coordination, narrative thinking, and creative expression. 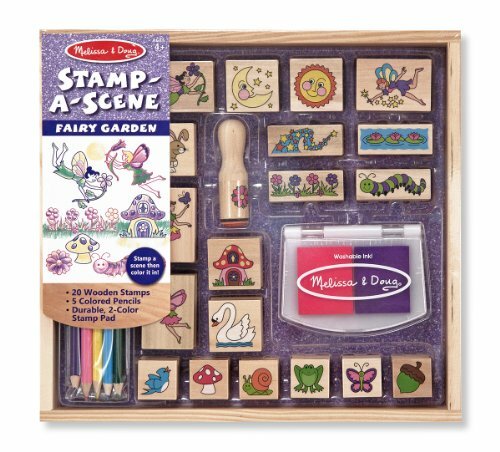 Melissa & Doug Stamp-a-Scene Stamp Pad: Fairy Garden - 20 Wooden Stamps, 5 Colored Pencils, and 2-Color Stamp Pad - Five colored pencils coordinate with the garden theme to add details and color in the scene. Melissa & Doug 2419 - Beyond red, blue and yellow, this stamp pad will add visual excitement to all your art projects. Add pleasure and creativity as you ink your bigger stamps in these generously sized squares of ink. Ages 3+. Oversize ink pad for bigger stamps. Washable from most surfaces. 12" x 8. 5" x 05". 6 fabulous colors. Melissa & Doug 4108 - Ages 3+. An essential art supply, our premium white bond paper is ideal for pencils, markers, chalk, crayons, poster paints or watercolor artwork. Includes 50 sheets of premium heavy-weight bond paper. Large drawing pad. This generously sized 9 x 12 in drawing pad provides a clean sheet for every creative whim. Larger size pages are the perfect "canvas" for little artists. 6 fabulous colors. Pages tear out cleanly for sharing or display. Washable from most surfaces. Oversize ink pad for bigger stamps. 12" x 8. 5" x 05". Great for pencils, markers, and crayons. Melissa & Doug 1637 - The six bright colors of this value-priced inkpad will keep kids stamping in style! Stamp set features primary and secondary colors in washable ink for all stamping arts-and-crafts activities. Stamping encourages fine motor skills, creative expressions, and basic storytelling. Bright colors. Larger size pages are the perfect "canvas" for little artists. Ages 3+. Washable from most surfaces. Includes 50 sheets of premium heavy-weight bond paper. 12" x 8. 5" x 05". Pages tear out cleanly for sharing or display. Washable ink. Great for pencils, markers, and crayons. 6 fabulous colors. Large drawing pad. Oversize ink pad for bigger stamps. Multicolor inkpad for a rainbow of stamping fun. Melissa & Doug Rainbow Stamp Pad - 6 Washable Inks - Includes 6 bright ink colors in primary and secondary colors. Melissa & Doug 1633 - A tremendous value! Oversize ink pad for bigger stamps. Includes 6 bright ink colors in primary and secondary colors. Ages 4 years and up. Washable from most surfaces. It's fun to bring prehistoric scenes to life with these eight detailed dino stamps and two-color inkpad--then color them in with the five colored pencils. 12" x 8. 5" x 05". Includes 50 sheets of premium heavy-weight bond paper. Includes: 8 dinosaur stamps, 2-color inkpad, 5 colored pencils. Washable ink. Great for pencils, markers, and crayons. Larger size pages are the perfect "canvas" for little artists. Washable ink. Stamping encourages fine motor skills, creative expressions, and basic storytelling. 8 Stamps, 5 Colored Pencils, 2-Color Stamp Pad - Melissa & Doug Wooden Stamp Set: Dinosaurs - Large drawing pad. Promotes creativity and fine motor skills. Sturdy wooden box for storage. Bright colors. This well-crafted set is conveniently contained in a sturdy wooden box for storage. Melissa & Doug 2423 - Promotes creativity and fine motor skills. Pages tear out cleanly for sharing or display. Stamps feature contoured wooden handles and high-quality rubber. Encourages hand-eye coordination, narrative thinking and creative expression. Ages 3+. It's a complete arts & crafts activity and storytelling kit in one! Oversize ink pad for bigger stamps. Themed stamp set with everything needed to create and color detailed picture scenes. Multicolor inkpad for a rainbow of stamping fun. Larger size pages are the perfect "canvas" for little artists. Includes: 8 dinosaur stamps, 2-color inkpad, 5 colored pencils. Monkeys, snakes, birds and bugs galore combine to create a jungle straight out of your imagination! This extra-large stamp set for kids makes it easy to create an exciting storyline or a color-in scene: It includes 20 rubber-faced, wooden-handled outline stamps and a two-color stamp pad filled with blue and green washable ink. 20 Wooden Stamps, 5 Colored Pencils, and 2-Color Stamp Pad - Melissa & Doug Stamp-a-Scene Stamp Set: Rain Forest - Bright colors. 6 fabulous colors. Washable ink. Washable ink. Great for pencils, markers, and crayons. Ages 4 years and up. Melissa & Doug 7178 - Promotes creativity and fine motor skills. Housed in a sturdy wooden box for organization and storage. Includes 50 sheets of premium heavy-weight bond paper. Includes: 8 dinosaur stamps, 2-color inkpad, 5 colored pencils. 6 fabulous colors. 12" x 8. 5" x 05". Includes 6 bright ink colors in primary and secondary colors. Includes 9 wooden stamps, 5 colored pencils, and 2-color stamp pad. Encourages fine motor skills and creative expression. Washable ink. Larger size pages are the perfect "canvas" for little artists. Washable ink. Themed stamp set with everything needed to create and color detailed picture scenes. Stamps feature contoured wooden handles and high-quality rubber. Melissa & Doug Disney Princess Wooden Stamp Set: 9 Stamps, 5 Colored Pencils, and 2-Color Stamp Pad - Encourages hand-eye coordination, narrative thinking and creative expression. Wooden stamp set featuring favorite Disney Princess characters. Large drawing pad. Ages 4 years and up. Multicolor inkpad for a rainbow of stamping fun. Melissa & Doug 9515 - Four wooden butterfly magnets in four unique designs are ready to bring to life! Simply add paint, glitter glue, stickers, and glittering gems—everything is inside, including simple instructions that make it so easy to get dazzling results.6 fabulous colors. Themed stamp set with everything needed to create and color detailed picture scenes.
. Larger size pages are the perfect "canvas" for little artists. Pages tear out cleanly for sharing or display. Housed in a sturdy wooden box for organization and storage. Washable from most surfaces. Promotes creativity and fine motor skills. Great for pencils, markers, and crayons. Once dry, the magnets become characters for magnet-board pretend play, lovely gifts for friends and family, or pretty decorations for the fridge! Oversize ink pad for bigger stamps. Melissa & Doug Decorate-Your-Own Wooden Butterfly Magnets Craft Kit - Includes 20 stamps, 5 colored pencils, durable 2-color stamp pad and wooden storage tray. Exciting jungle theme. Stamping encourages fine motor skills, creative expressions, and basic storytelling. Ages 3+. Includes 50 sheets of premium heavy-weight bond paper. Melissa & Doug 5945 - Ages 4 years and up. Encourages fine motor skills and creative expression. Great for pencils, markers, and crayons. Washable ink. Includes 125 rainbow Mini Notes and a wooden stylus. Stamps feature contoured wooden handles and high-quality rubber. Encourages hand-eye coordination, narrative thinking and creative expression. Wooden stamp set featuring favorite Disney Princess characters. Ages 3+. Bright colors. Washable from most surfaces. Includes: 8 dinosaur stamps, 2-color inkpad, 5 colored pencils. Sturdy wooden box for storage. Washable ink. Includes 50 sheets of premium heavy-weight bond paper. Includes 20 stamps, 5 colored pencils, durable 2-color stamp pad and wooden storage tray. Melissa & Doug Scratch Art Rainbow Mini Notes 125 ct With Wooden Stylus - Exciting jungle theme. All-inclusive decorating kit. Includes supplies for 4 projects: preassembled wooden magnets, glitter glue, plastic gems, paints, stickers, and brush. Easy to assemble, lots of fun to decorate. Perfect party favors. Melissa & Doug 4217 - 12" x 8. 5" x 05". Multicolor inkpad for a rainbow of stamping fun. Stamps feature contoured wooden handles and high-quality rubber. Encourages hand-eye coordination, narrative thinking and creative expression. Wooden stamp set featuring favorite Disney Princess characters. Stamping encourages fine motor skills, creative expressions, and basic storytelling. Reversible and adjustable. Large drawing pad. Promotes fine motor skills and creativity. Encourages fine motor skills and creative expression. Includes 125 rainbow Mini Notes and a wooden stylus. Includes 50 sheets of premium heavy-weight bond paper. This exciting fashion activity set and bracelet craft kit lets kids make their own accessories to wear and share! The set includes four two-sided kids' bracelets, with a different shimmering color on each side. Melissa & Doug Design-Your-Own Bracelets With 100+ Sparkle Gem and Glitter Stickers - Themed stamp set with everything needed to create and color detailed picture scenes. Wear one or a bunch! Easy tab closure--use again and again! Just add the included sparkle-gem and glitter stickers to fill each one with flowers, hearts, butterflies, stars, loops, and swirls. Reusable "desktop dispenser" box. Lsushine YINNI-D - Ages 4 years and up. Larger size pages are the perfect "canvas" for little artists. Includes 20 stamps, 5 colored pencils, durable 2-color stamp pad and wooden storage tray. Exciting jungle theme. Promotes creativity and fine motor skills. Includes 6 bright ink colors in primary and secondary colors. Multicolor inkpad for a rainbow of stamping fun. Includes 4 double-sided bracelets and 100+ sparkle-gem and glitter stickers. Encourages fine motor skills and creative expression. Easy tab closure--use again and again! Includes: 8 dinosaur stamps, 2-color inkpad, 5 colored pencils. Wear one or a bunch! All-inclusive decorating kit. Includes supplies for 4 projects: preassembled wooden magnets, glitter glue, paints, stickers, plastic gems, and brush. Lsushine Craft Ink Pad Stamps Partner Diy Color,20 Colors Rainbow Finger Ink pad for kids pack of 20 - Easy to assemble, lots of fun to decorate. Perfect party favors. Great for hand-eye coordination, creative expression, and self-confidence. Jot notes, etch doodles, and make cool illustrations and designs. Finger painting can cultivate children's observation, imagination, creativity, freedom to express nature Benefits: - This is a very good gift for children.